3 Can we predict protection between strains? Unfortunately, at present the answer is ABSOLUTELY NEGATIVE. It is not possible to predict the level of protection that a given field strain or vaccine will afford against an infection with a new strain. As it has been discussed, the virus variability is extreme in many aspects (see section What is the PRRS virus?). Also, significant gaps still exist in PRRS virus immunology, such as the exact identification of NA and T cell epitopes that may induce a protective response (see Immunology against PRRS). For instance, when GP3, GP4 and GP5 are sequenced, no correlation exists between the neutralisation of the isolates and 1) the sequence of neutralising epitopes already described, and 2) the number of N-linked glycosylation sites in different proteins. It is a proven fact that if a given strain induces high levels of NAs and/or cell-mediated immunity the chance of protection may be higher; however, it should be also considered that we are dealing with probabilities. Can we use genome sequences to predict the level of protection among strains? When sequences from different strains are compared (only GP5, or all structural proteins or even the whole genome), it has been demonstrated that the protection afforded by a given vaccine or a given field strain against another strain cannot be simply predicted by an overview of the genetic identity. Genetic identity is not a good predictor of the degree of protective immunity conferred by a vaccine. The specific ability of the virus used in the immunisation to induce NAs or IFN-γ-SC and to modulate immune response. The hardness neutralising the virus responsible for the re-infection. The specific ability of the virus responsible for the re-infection to modulate immune response. Other: period since the vaccination (remembering that the development of immunity against PRRS virus is slow), infection pressure, etc. © Laboratorios Hipra, S.A. 2019. All Rights Reserved. No part of this website or any of its contents may be reproduced, copied, modified or adapted, without the prior written consent of HIPRA. Bautista EM, Molitor TW. Cell-mediated immunity to porcine reproductive and respiratory syndrome virus in swine. Viral Immunol. 1997, 10: 83-94. Bautista EM, Molitor TW. IFN gamma inhibits porcine reproductive and respiratory syndrome virus replication in macrophages. Arch Virol. 1999, 144:1191-200. Butler JE, Lager KM, Golde W, Faaberg KS, Sinkora M, Loving C, Zhang YI. Porcine reproductive and respiratory syndrome (PRRS): an immune dysregulatory pandemic. Immunol Res. 2014, 59:81-108. Darwich L, Díaz I, Mateu E. Certainties, doubts and hypotheses in porcine reproductive and respiratory syndrome virus immunobiology. Virus Res. 2010, 154:123-32. Díaz I, Darwich L, Pappaterra G, Pujols J, Mateu E. Different European-type vaccines against porcine reproductive and respiratory syndrome virus have different immunological properties and confer different protection to pigs. Virology. 2006, 351:249-59. Díaz I, Gimeno M, Darwich L, Navarro N, Kuzemtseva L, López S, Galindo I, Segalés J, Martín M, Pujols J, Mateu E. Characterization of homologous and heterologous adaptive immune responses in porcine reproductive and respiratory syndrome virus infection. Vet Res. 2012, 19:43:30. Dwivedi V, Manickam C, Binjawadagi B, Linhares D, Murtaugh MP, Renukaradhya GJ. Evaluation of immune responses to porcine reproductive and respiratory syndrome virus in pigs during early stage of infection under farm conditions. Virol J. 2012, 9:45. Kimman TG, Cornelissen LA, Moormann RJ, Rebel JM, Stockhofe-Zurwieden N. Challenges for porcine reproductive and respiratory syndrome virus (PRRSV) vaccinology. Vaccine. 2009, 27:3704-18. Labarque GG, Nauwynck HJ, Van Reeth K, Pensaert MB. Effect of cellular changes and onset of humoral immunity on the replication of porcine reproductive and respiratory syndrome virus in the lungs of pigs. J Gen Virol. 2000, 81:1327-34. Lopez OJ, Osorio FA. Role of neutralizing antibodies in PRRSV protective immunity. Vet Immunol Immunopathol. 2004, 102:155-63. Lowe JE, Husmann R, Firkins LD, Zuckermann FA, Goldberg TL. Correlation of cell-mediated immunity against porcine reproductive and respiratory syndrome virus with protection against reproductive failure in sows during outbreaks of porcine reproductive and respiratory syndrome in commercial herds. J Am Vet Med Assoc. 2005, 226:1707-11. Lunney JK, Benfield DA, Rowland RR. Porcine reproductive and respiratory syndrome virus: an update on an emerging and re-emerging viral disease of swine. Virus Res. 2010, 154:1-6. Martelli P, Gozio S, Ferrari L, Rosina S, De Angelis E, Quintavalla C, Bottarelli E, Borghetti P. Efficacy of a modified live porcine reproductive and respiratory syndrome virus (PRRSV) vaccine in pigs naturally exposed to a heterologous European (Italian cluster) field strain: Clinical protection and cell-mediated immunity. Vaccine. 2009, 27:3788-99. Martínez-Lobo FJ, Díez-Fuertes F, Simarro I, Castro JM, Prieto C. Porcine Reproductive and Respiratory Syndrome Virus isolates differ in their susceptibility to neutralization. Vaccine. 2011, 29:6928-40. Mateu E, Diaz I. The challenge of PRRS immunology. Vet J. 2008, 177:345-51. Meier WA, Galeota J, Osorio FA, Husmann RJ, Schnitzlein WM, Zuckermann FA. Gradual development of the interferon-gamma response of swine to porcine reproductive and respiratory syndrome virus infection or vaccination. Virology. 2003, 309:18-31. Mengeling WL, Lager KM, Vorwald AC, Koehler KJ. Strain specificity of the immune response of pigs following vaccination with various strains of porcine reproductive and respiratory syndrome virus. Vet Microbiol. 2003, 93:13-24. Miranda J, Torrents D, Busquet M, Fenech M, Mateu E, Díaz I. Heterologous cell-mediated immune responses against PRRS virus in gilts vaccinated intramuscularly and intradermally with UNISTRAIN® PRRS. 2015, 7th International Symposium on Emerging and Re-emerging Pig Diseases. Murtaugh MP, Xiao Z, Zuckermann F. Immunological responses of swine to porcine reproductive and respiratory syndrome virus infection. Viral Immunol. 2002, 15:533-47. Murtaugh MP, Genzow M. Immunological solutions for treatment and prevention of porcine reproductive and respiratory syndrome (PRRS). Vaccine. 2011, 29:8192-204. Murtaugh MP, Stadejek T, Abrahante JE, Lam TT, Leung FC. The ever-expanding diversity of porcine reproductive and respiratory syndrome virus. Virus Res. 2010, 154:18-30. Rose N, Renson P, Andraud M, Paboeuf F, Le Potier MF, Bourry O. Porcine reproductive and respiratory syndrome virus (PRRSv) modified-live vaccine reduces virus transmission in experimental conditions. Vaccine. 2015, 33:2493-9. Pileri E, Gibert E, Soldevila F, García-Saenz A, Pujols J, Diaz I, Darwich L, Casal J, Martín M, Mateu E. Vaccination with a genotype 1 modified live vaccine against porcine reproductive and respiratory syndrome virus significantly reduces viremia, viral shedding and transmission of the virus in a quasi-natural experimental model. Vet Microbiol. 2015, 175:7-16. Prieto C, Alvarez E, Martínez-Lobo FJ, Simarro I, Castro JM. Similarity of European porcine reproductive and respiratory syndrome virus strains to vaccine strain is not necessarily predictive of the degree of protective immunity conferred. Vet J. 2008, 175:356-63. Roca M, Gimeno M, Bruguera S, Segalés J, Díaz I, Galindo-Cardiel IJ, Martínez E, Darwich L, Fang Y, Maldonado J, March R, Mateu E. Effects of challenge with a virulent genotype II strain of porcine reproductive and respiratory syndrome virus on piglets vaccinated with an attenuated genotype I strain vaccine. Vet J. 2012, 193:92-6. Royaee AR, Husmann RJ, Dawson HD, Calzada-Nova G, Schnitzlein WM, Zuckermann FA, Lunney JK. Deciphering the involvement of innate immune factors in the development of the host response to PRRSV vaccination. Vet Immunol Immunopathol. 2004, 102:199-216. Scortti M, Prieto C, Martínez-Lobo FJ, Simarro I, Castro JM. Effects of two commercial European modified-live vaccines against porcine reproductive and respiratory syndrome viruses in pregnant gilts. Vet J. 2006, 172:506-14. Weesendorp E, Morgan S, Stockhofe-Zurwieden N, Popma-De Graaf DJ, Graham SP, Rebel JM. Comparative analysis of immune responses following experimental infection of pigs with European porcine reproductive and respiratory syndrome virus strains of differing virulence. Vet Microbiol. 2013, 163:1-12. Yoon KJ, Wu LL, Zimmerman JJ, Platt KB. Field isolates of porcine reproductive and respiratory syndrome virus (PRRSV) vary in their susceptibility to antibody dependent enhancement (ADE) of infection. Vet Microbiol. 1997, 55:277-87. Zimmerman JJ, Benfield DA, Dee SA, Murtaugh MP, Stadejek T, Stevenson GW, Torremorell M. Porcine reproductive and respiratory syndrome virus (porcine arterivirus). In: 10th ed. Diseases of swine, Ed. Wiley-Blackwell. 2012, 31:463-86. 5 Why NAs does not develop as strongly and early as non-NAs? 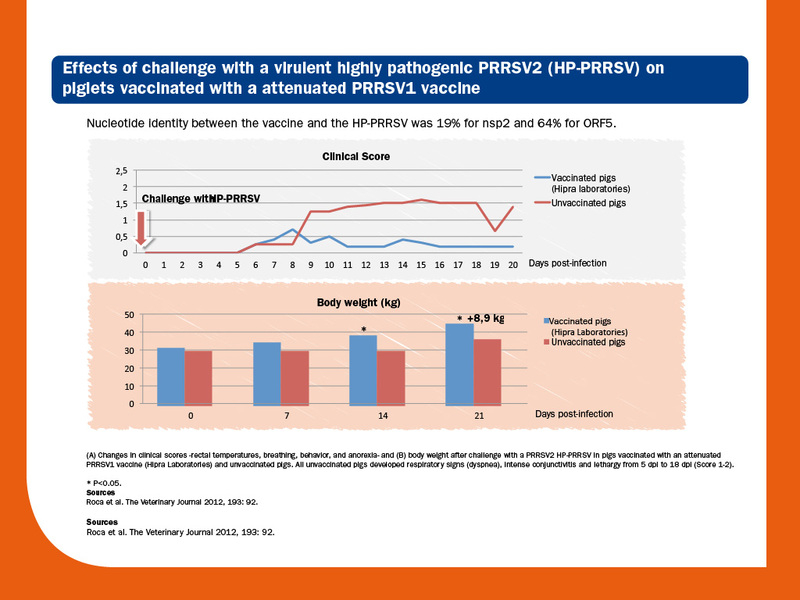 6 Why cell-mediated immunity against PRRS virus is slow and weak? 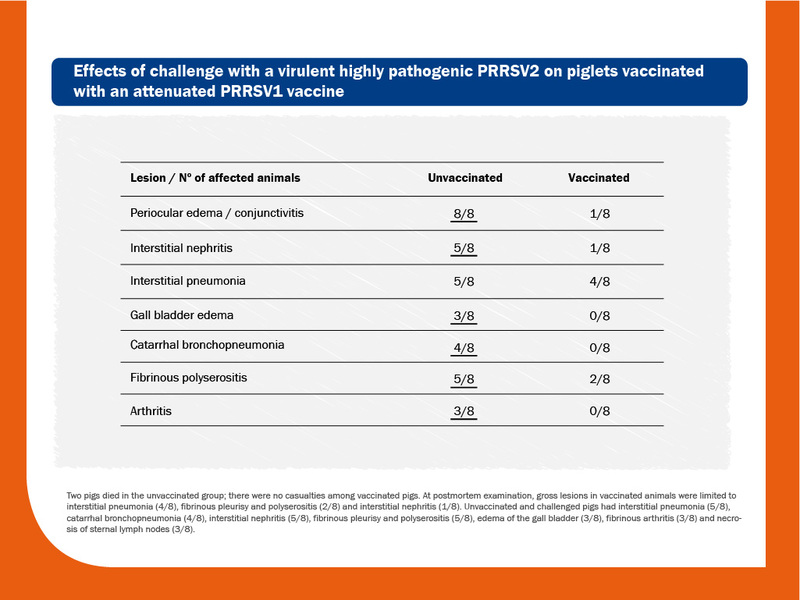 2 So… are the current PRRS virus vaccines useful? 7 What is the role of NAs and cell-mediated immunity? 3 What happens in a confirmed PRRS virus farm? 4 How many strains can be found within a given farm? 5 How to quantify PRRS virus transmission?